Powered gantry cranes are available for high capacity, long span applications. 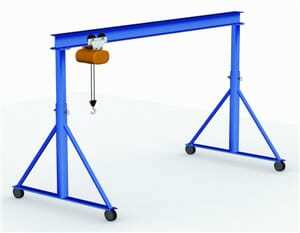 Fixed gantry cranes are ordered to a specific height and span. 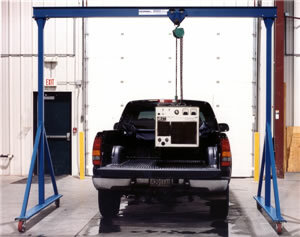 Adjustable A frame gantries are ordered based on a span and height range. Most adjustable gantry cranes are adjustable height while some have an adjustable span. These are particularly useful when the gantry crane is used in multiple applications as it can be easily changed to fit where needed. Most powered gantry cranes run on a v-groove track or ASCE rail. Both can be installed directly onto a smooth concrete surface or recessed into the floor to eliminate tripping hazards. A powered gantry is motorized by either one or two drives (depending on the span and capacity). Powered gantry cranes are usually equipped with electric chain or wire rope hoists. These gantry cranes are usually used in heavier capacity applications or with increased spans. A Semi-Gantry Crane has one leg that runs on an elevated runway and one leg that runs on the ground. It is half overhead crane and half gantry crane. This allows for more usable floor space by utilizing an elevated runway located next to building columns. It also allows the crane to span only a portion of the bay. 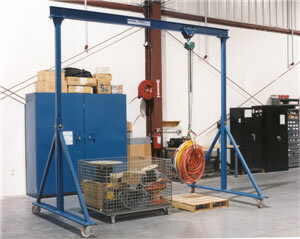 Portable Gantry Cranes are easy to relocate to where you need to pick up, move or rotate a load. A variety of casters are available for different types of surfaces including non skid and outdoor wheels. Portable gantries are available in light weight aluminum that is easy to disassemble and move from one jobsite to another as well as the standard steel type. Both steel and aluminum are available as either fixed height or adjustable. Chain fall hoists, single phase electric chain hoists, and air hoists are the most common lifting devices for this type of gantry crane. Call CraneWerks today, 888-544-2121, or fill out one of our request for quote forms for more information or a quote on a gantry crane that meets your needs. 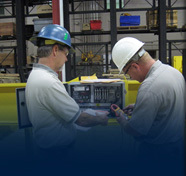 Not sure if a gantry crane is right for you? Call one of our sales associates and let us help you decide.